If you are having brace treatment you will of heard your dentist talking about Interdental stripping, Interproximal reduction (IPR), enamel reduction, slenderising, stripping…. But what is it? Interdental stripping is the mechanical removal of some of the outer tooth surface called enamel from in between the teeth. 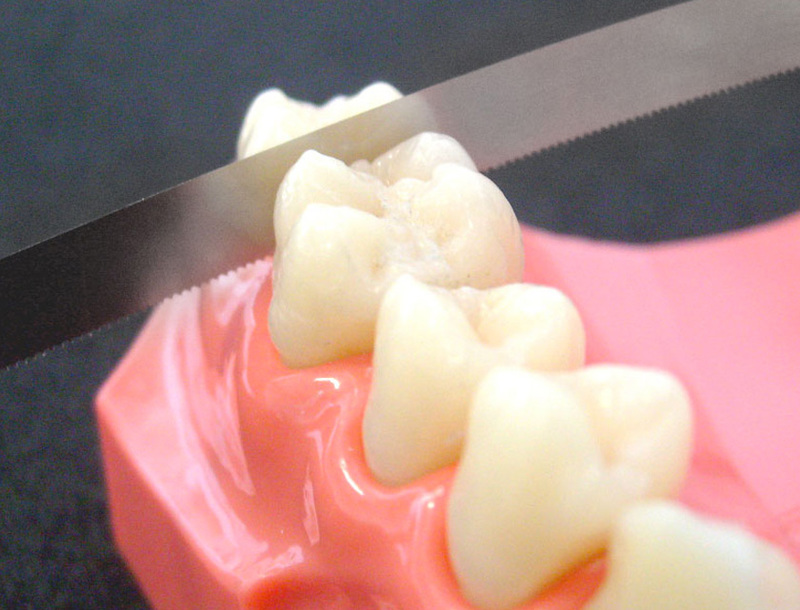 It is possible to reduce the width of certain teeth by up to ½ mm. The space created by interdental reduction can then be used to straighten the teeth. Your dentist needs to gain enough space in order to straighten your teeth and improve your bite. If the space required is small, then it can be achieved by interproximal reduction of several teeth. This could avoid the need for extracting teeth. A disc in a dental handpiece. By hand with an abrasive strip. Interproximal reduction takes only a few minutes and can be done in a single visit or spread over several visits. No. Enamel is the material that makes up the outer shell of our teeth. It does not contain any nerves and so no discomfort is felt. As only a very thin layer of enamel is removed, no anaesthetic is required. You may, however, feel a strange pulling/ pushing pressure during the procedure. It’s more of a nails down a chalkboard sensation. Will I have any problems with my teeth if my enamel is removed? No. The dentist will only remove the minimum amount of enamel required to get your teeth straight. Each tooth will be left with enough enamel to continue to remain healthy and sound. Studies have shown that the decay rates of teeth that have had interproximal reduction are no higher than normal teeth. Will my teeth be painful? No. Some patients, however, may experience some temporary sensitivity to hot or cold foods and drinks but this usually returns to normal within a few days. Will it give me gum disease? No. The procedure does not make your teeth more at risk to gum disease. It is important for you to keep your teeth and gums clean and healthy throughout your orthodontic treatment. It is important to be aware that interdental stripping is recognised and approved by the General Dental Council.